Spot silver prices took their cue from the spot gold price market yesterday, and ended the silver trading session with a wide spread down bar which reversed all the gains of Tuesday, and ended the silver trading session below the 9 day moving average and marginally above the 14 day moving average. What is particularly worrying technically is that this is a bearish engulfing candle which now reinforces the shooting star candle of Wednesday last week, which is now sitting at the top of the rally like a beacon on a hill top, so we have some conflicting analysis. First, Monday’s hammer candle was confirmed by Tuesday’s price action, and in turn this has been followed by a bearish signal which has validated the bearish candle of last week. On the positive side, yesterday’s close for the spot silver price, seemed to find support from the 14 day moving average which would seem to suggest that the bullish momentum remains intact. 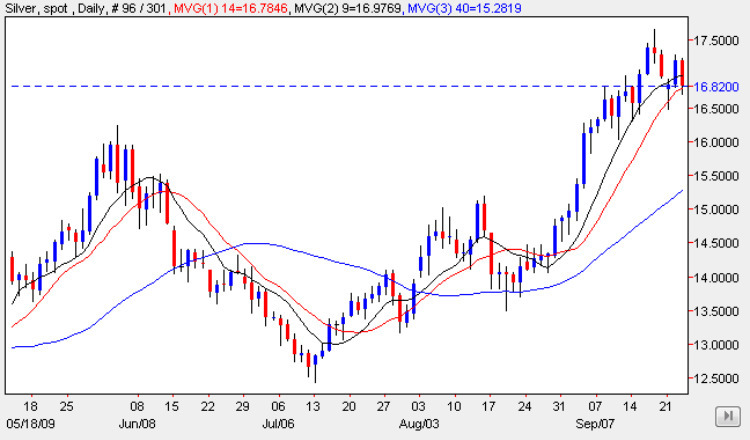 However, as I have outlined several times before in the silver market commentary, silver prices are now reaching a critical point on the daily chart as they attempt to break through the heavy congestion area immediately ahead, which at the moment seems to be providing solid resistance to any move higher. Until we see this level between $16.80 and $18.50 at least penetrated, if not breached, the spot silver will continue to struggle at this level. The weekly chart is also mildly bearish with a long legged doji candle from last week reinforcing this picture, so we need to be careful in our silver trading over the next few days. The key will be whether spot silver has sufficient momentum to break into this heavy resistance and continue moving forward, and last nights FED statement provided little to excite the markets, so we now need to wait for the next tranche of fundamental news, which hopefully will provide the momentum that the spot silver market now requires to move higher once again. The short term outlook for spot silver prices is bearish, the medium term is sideways and the long term is bullish.